Many of our customers ask how the distinct markings in reclaimed wood came to be. Here are images and background that explain those curious marks. The thousands of sawmills in New England for about 200 years beginning in the 1630s used essentially a single technology—a wooden waterwheel with a crank connected by the ‘pitman’ arm to a wooden sash (frame) in which was mounted a straight saw blade. The reciprocating motion of the vertically mounted saw results in the characteristic straight “up and down” saw marks on boards and timbers cut on these sash-type saws. A whipsaw or pitsaw was originally a type of saw used in a saw pit, and consisted of a narrow blade held rigid by a frame and called a frame saw or sash saw. This evolved into a straight, stiff blade without a frame, up to 14 feet long and with a handle at each end, the upper called the tiller and the lower one being the box, so called from its appearance and because it could be removed when the saw was taken out of one cut to be positioned in another <Salaman, 426-429>. It was used close to the felling site to reduce large logs into beams and planks. 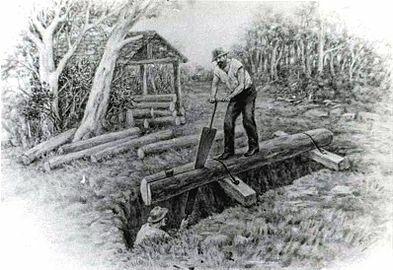 Sawyers either dug a large pit or constructed a sturdy platform, enabling a two-man crew to saw, one positioned below the log called the pit-man, the other standing on top called the top-man. The saw blade teeth were angled and sharpened as a rip saw so as to only cut on the downward stroke. On the return stroke, the burden of lifting the weight of the saw was shared equally by the two sawyers, thereby reducing fatigue and backache. The pitman had to contend with sawdust in his mouth and eyes and the risk of being crushed by a falling log, although modern photographs <Arnoult, Annie, La Grande Histoire des Scieurs de Long> show the saw dust falling, as would be expected, away from the pitman, the teeth being on the opposite edge from him. Ten foot logs were sometimes sawn into boards except for about the last two inches. In this way the boards could be more easily handled; then the boards were separated by cutting off the end of the log. Up to 200 boards a day could be produced with water-driven power sawing, compared to the 12 or so a day by two men in a saw pit. A saw pit could, if circumstances demanded, be worked by a single person, the end of the saw being weighted with a stone or some other weight, and then raised and lowered by the sawyer.